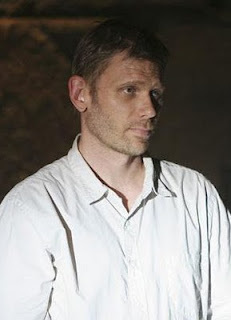 Celebrity Extra: Interview: Mark Pellegrino — Jesus or Lucifer? 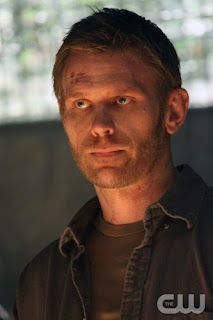 Interview: Mark Pellegrino — Jesus or Lucifer? Many know him as Jacob from Lost or Lucifer from Supernatural. I know him as a really nice guy who was a joy to interview. I caught up with Mark Pellegrino (photo left, credit: ABC) a few weeks ago to discuss being on such an iconic television show, life in Hawaii and his plans for the future. When you were cast as Jacob on Lost last year, had you been a fan of the show, or did you have to do some quick catching up? I had to do some quick catching up, that’s for sure. I almost don’t own a TV. We have one here for watching movies and stuff, and my wife watches TV to relax, but I’m so busy I can’t usually watch unless I get cast in something and have to watch to do some research. Because of the great secrecy, do you receive the entire script, or just the scenes you are in? How protective are they of that? The scripts do come with a special tape on them – I don’t know what the tape means, it’s a kind of reflective tape – and it is delivered directly to the house. I do get the whole script for the episode, surprisingly enough, and I get it about a week in advance. And I’m surprised about that, because people are so hot after the material, you’d think they’d be even more cautious that somebody would steal it off the doorstep. How is the cast to work with, and how do you like shooting in Hawaii? Shooting in Hawaii is great. I don’t get to see the island too much unless I have some free time and I’ll bring my wife out there. Otherwise I am in my hotel room hunkered down, reading the script and working on that, and writing and catching up on movies and stuff. But it is really beautiful, and I’ve done a few of the touristy things. The cast is just phenomenal – not only great actors, but they’re really good people. I’ve worked a lot with Jorge Garcia (giggles) and he’s a really funny guy, (giggles) and a really really good actor (giggles). I’m laughing at something, I don’t even know if I can say – just the way that we work with each other off-camera, he kind of laughs at me and has fun with me. And I’ve worked with Matt (Fox). He’s a really great guy, and so intense, as intense as his character onscreen. So is Nestor (Carbonell), who actually studied at the theater company that I teach at and studied there for a while. He’s a really great guy. It’s nice – it’s a nice group of people. Luckily I didn’t know it was a huge phenomenon until I landed on the island and was told. There audition sides are not the character name, and the scenes are not the scenes you end up doing. It’s all made-up stuff to throw off all the bloggers and people on the Internet who are trying to get the material. Sounds crazy, but I had no idea what it meant until I got there. That must be difficult for the casting team, because they have people auditioning for roles, but it’s not the material they’ll be doing, or even the character name. You know, in a way I am glad they did it that way, because it’s such an iconic role, you don’t want to fall into traps. You could try to act the stature of the part, and it’s really so much more simple and down-to-earth. It’s a good thing to be Jesus the carpenter, as opposed to Jesus in the Gospel of John, the God-like figure. That’s hard to act – the carpenter’s better. If you had Jacob’s God-like powers, how would you like to see the show end? I hope it ends well, and I hope Jacob’s point of view about human nature is born out, that’s for sure, because I think it says something about us. I don’t know what that means, but I just hope it ends well, and that my point of view wins out. But I don’t know what that means in concrete fact; I don’t know what that means with respect to the characters. Playing Jacob certainly is a change from playing your character on Supernatural, which happens to be Lucifer (photo left, credit: David Gray/The CW). It is fun. In fact I leave on Monday to do some more Supernatural stuff, and I’m looking forward to that because we’re in the middle of the apocalypse. But playing Lucifer is fun; he’s a fun bag of tricks. How did you make your Lucifer different from other Lucifers in past movies and TV shows? I guess it’s just to enjoy the different Lucifers I’ve seen in past films and know that this Lucifer is written very differently than the other ones. This Lucifer is written as a very down-to-Earth, honest person. I think I have justice on my side, and that’s a very strong place to come from. I don’t have to lie, pretend, fool anybody, charm anybody – I just tell the truth. That’s pretty unconventional. I can’t think of too many Lucifers who’ve had to deal with those circumstances. They are usually big, iconic, charming, interesting ... although Viggo Mortensen was kind of an interesting – he played Lucifer in Prophecy, didn’t he? He was an interesting, down-to-earth kind of devil, in a way. You’ve been on a lot of top-notch television shows, like Burn Notice, Dexter, Grey’s Anatomy. What have been some of your favorite experiences and why? I was coming out of the make-up trailer of Grey’s Anatomy, and Sandra Oh was like, “Oh my God!” and grabs me by the face, kisses me on the face and hugs me. She’s apparently a big Dexter fan. It was a totally shocking experience to have that happen. So that was a really nice, enjoyable experience. Being on Dexter was funny too, because me and Michael C. Hall were rivals in the show for Julie Benz’s affection, and for the first episode or two, we didn’t really speak to each other. And I thought he didn’t like me, and he thought I didn’t like him. So we had this totally antagonistic type of relationship, and we never really dealt with it for the first couple of shows until one day by chance, we were at craft services eating something at the same time. And I forget who broke the ice, but one of us just started talking, and we realized that he thought I didn’t like him, I thought he didn’t like me, and we became friends. He’s a nice guy. And I hope he found out I’m nice too. Is there a particular show you get recognized for more when fans approach you on the street? Well lately it’s been Dexter, Lost and Supernatural, but I do get a lot of: “I think I know you from somewhere.” Like they think they met me at a party somewhere, but they really saw me maybe on Burn Notice or something. But I’ve been getting a lot of recognition for Lost now. I’ve been getting people walking up to me in the supermarket. Just the other day when they had the premiere, I was getting groceries for my family, and a girl asked, “Are you Jacob from Lost?” And I said, “Yes.” And she said, “We are having a dinner party for you tonight. What are you doing in Valencia?” And I told her I live here with my family, and she says: “Oh, OK, good. Well, all right. Bye!” It’s an interesting phenomenon, definitely. You played lots of different and interesting characters in your career, but what would your dream role be? A dream role would be Charlie in Flowers for Algernon, I’m kind of obsessed with it, but I think Will Smith is going to do it. But it’s been a project that I’ve loved for a long time. Actually there is a pilot that Frank Darabont is doing called Walking Dead that I am totally into, and I just went out for it. That would be kind of a dream role. I love the zombie/apocalypse thing and horror. This is from a series of graphic novels, and I like the main character a lot. It’s kind of like 28 Days Later. He wakes up in the hospital after being shot, and the apocalypse has happened and he has to find his way to safety. It’s kind of a cool scenario. And you can’t go wrong with Frank Darabont; I love his work.